How many people have heard of Monty Hall? The Monty Hall problem is a probability puzzle loosely based on the American television game show Let’s Make a Deal. The name comes from the show’s original host, Monty Hall. The problem is also called the Monty Hall paradox, as it is a veridical paradox in that the result appears absurd but is demonstrably true. Imagine that the set of Monty Hall’s game show Let’s Make a Deal has three closed doors. Behind one of these doors is a car; behind the other two are goats. The contestant does not know where the car is, but Monty Hall does. The contestant picks a door and Monty opens one of the remaining doors, one he knows doesn’t hide the car. If the contestant has already chosen the correct door, Monty is equally likely to open either of the two remaining doors. 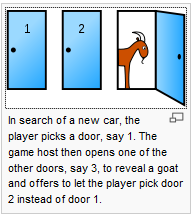 After Monty has shown a goat behind the door that he opens, the contestant is always given the option to switch doors. What is the probability of winning the car if the contestant stays with their first choice? What if the contestant decides to switch? If the player switches from their original choice then they double the overall probability of winning the car from 1/3 to 2/3. Amazing isn’t it, and it’s mathematically proven so… sadly, I’m not going to try and explain it here, instead I suggest you look here on wikipedia if you want to understand the science. So the moral of this story is … always change your mind if a bloke opens a door and there is a goat behind… you might just win a car…. !! !